I’m so happy to finally share the wintery project I finished in September with you – pretty unusual for a last-minute kind of girl like me. 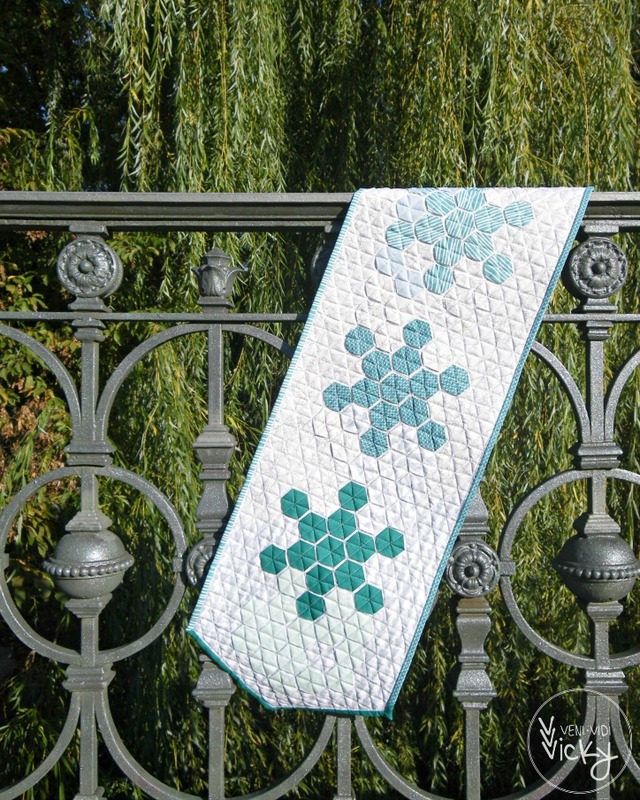 I was approached by the German Patchwork Guild to create a table runner, using Modern Handcraft‘s modern hexies method for their Christmas issue. The magazine came out over the weekend and it was pretty neat to see my first published project in print! 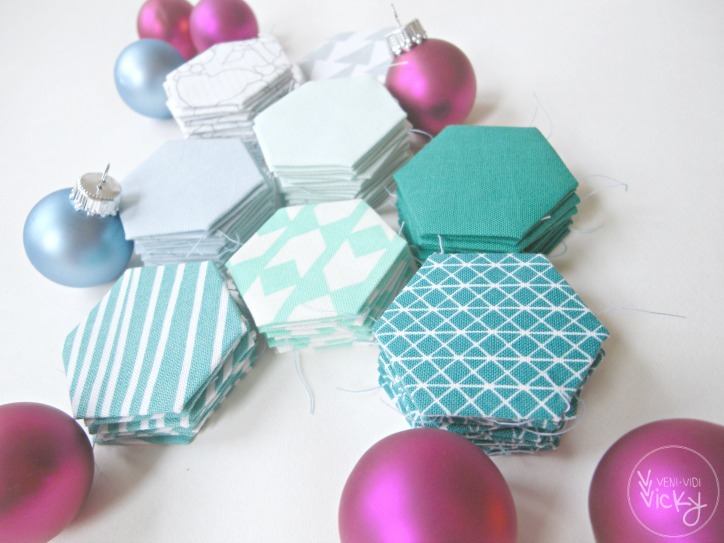 If you want to make your own ‘ice needles’ I highly recommend checking out the modern hexies method. My runner finishes at 14” x 45”. I have a template for 1” hexies you can download here. Some of my favourite photos didn’t make the cut for the article, so I’m sharing them exclusively with you! Even though I took these pics over two months ago the weather isn’t much different right now in Germany. After going an entire winter without a single snow day last year I was hoping 2014 would make up for it. No snow yet but I’m not giving up hope – White Christmas, I’m looking at you!! I’m thankful for being given the opportunity to getting my word out there by publishing this project. This guild is pretty focused on traditional quilters, so I feel especially honoured to being asked to contribute to their magazine. 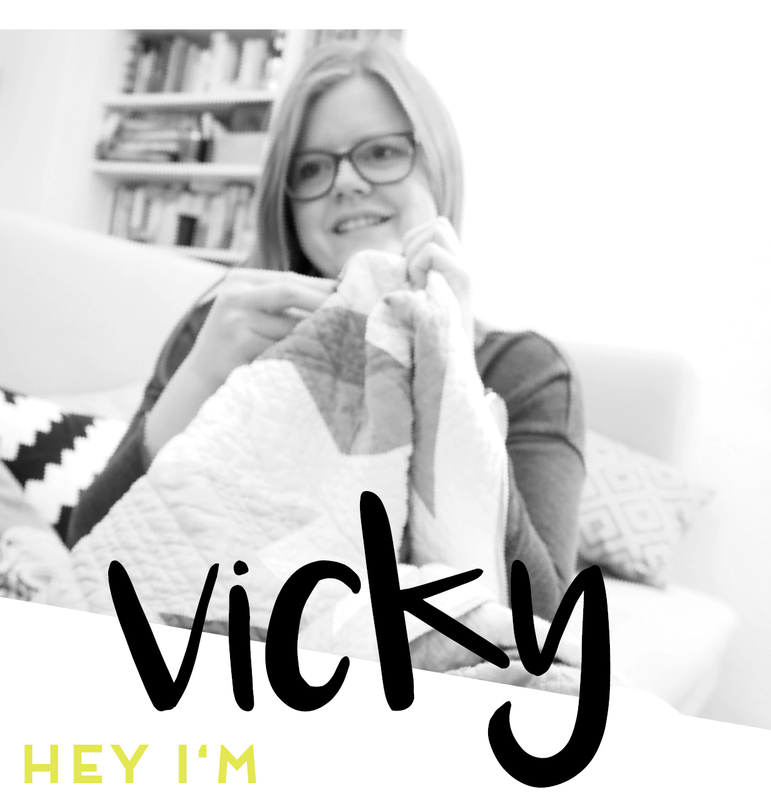 What are you, as a quilter, proud of in 2014? at Quilt Story and Let's Bee Social at Sew Fresh Quilts. Wirklich eine ganz tolle Idee, der Läufer ist traumschön! Wunder- wunderschön liebe Vicky!! Die Farben sind einfach super! I love all your hexie projects. So beautiful! Such a pretty piece and an interesting technique, too. Love the soft colors. Thanks for sharing. Congratulations on your publication! That is so exciting! And it is really beautiful. I love the colors and the winter look. I like how you designed it with the entire winter theme in mind instead of just Christmas. I LOVE Christmas, but I have a hard time decorating for it when it is so much work for such a short period of time. Beautiful work! Congratulations Vicky! 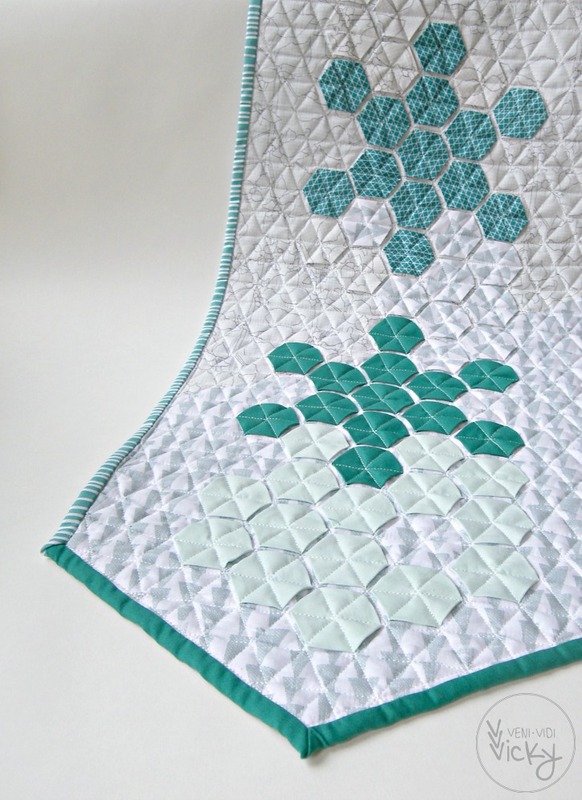 Love this winter themed hexi runner. And the great photos. Even the name is beautiful! 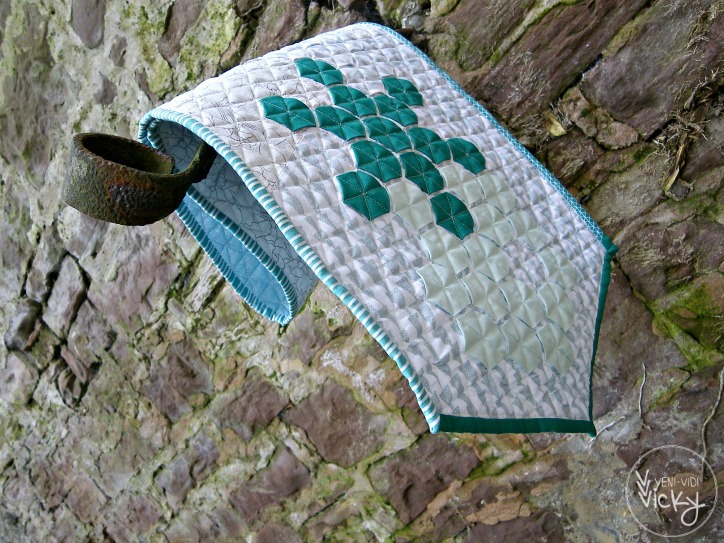 Congratulations on the publication – the pattern is lovely and your photographs are beautiful! 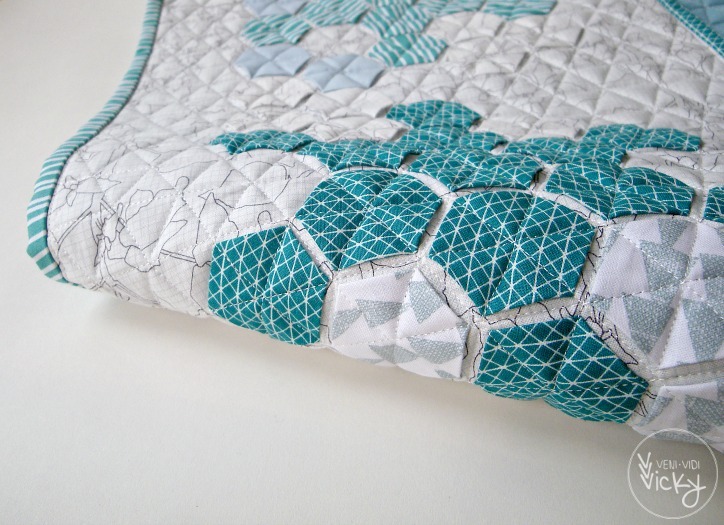 I am proud to have started my own quilting business in 2014. It was a big leap for me, but something I am proud to have finally decided to do. Visiting from Let’s Bee Social. I am loving hexagons right now, and this is a fantastic technique! The runner is gorgeous, and the color scheme is really perfect for an item intended to be used all season. Love this table runner. The colors are fantastic. Congrats on seeing yourself ‘in print’! I’m in Wisconsin – no snow here either – still time to have some by Christmas I hope! Congratulations on your publish!! This is such a neat project and I love your photos of it. 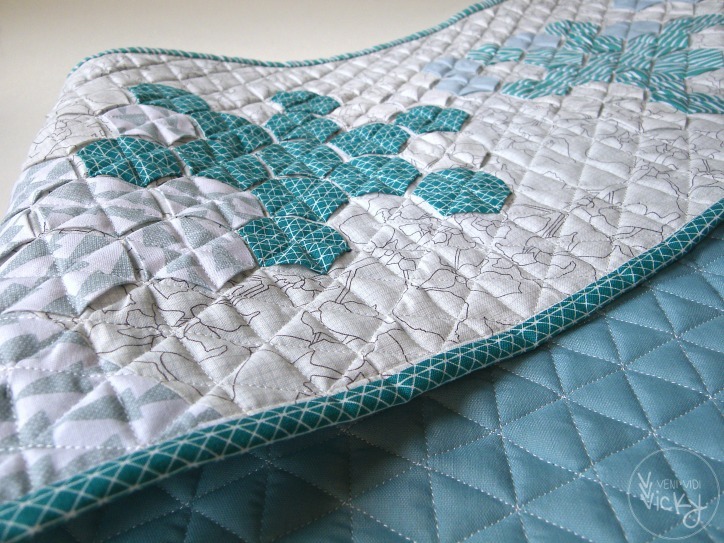 I’m a big fan of these more 30dimentional quilt projects I’m seein more lately!